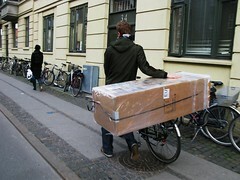 Like anywhere else, things have to be transported in Copenhagen. 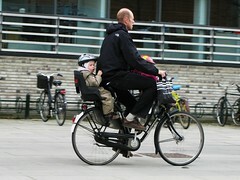 By and large, a bicycle is involved. I don't know what this chap bought, but he wouldn't have been able to get it home without his bike unless he hired a taxi. But your bike is multi-functional. Not only a faithful ride, but a workhorse as well. Duplicate this shot thousands and thousands of times and you have an idea of what a weekday afternoon looks like in Copenhagen. And here's a bit of fun from down south. The arab world to be [not that] precise. Since he's not really riding that fast, I suppose it qualifies for Style Over Speed.